An impressive German Lutheran church located near the Holy Sepulcher, built at the end of the 19th C over the ruins of a Crusaders church. Galatians 3 13: "Christ hath redeemed us"
An impressive German Lutheran (Protestant) church located in the Christian quarter, near the Holy Sepulcher. 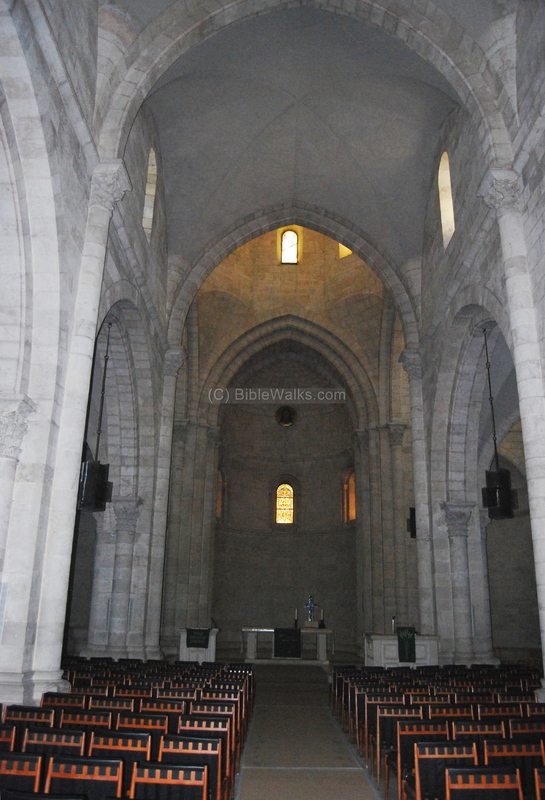 It was built at the end of the 19th C over the ruins of a Crusaders period church. 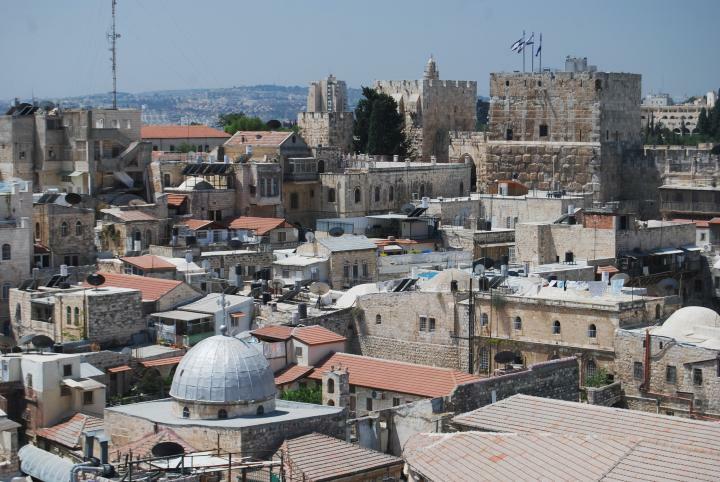 From its tall bell tower are amazing views of the old city. 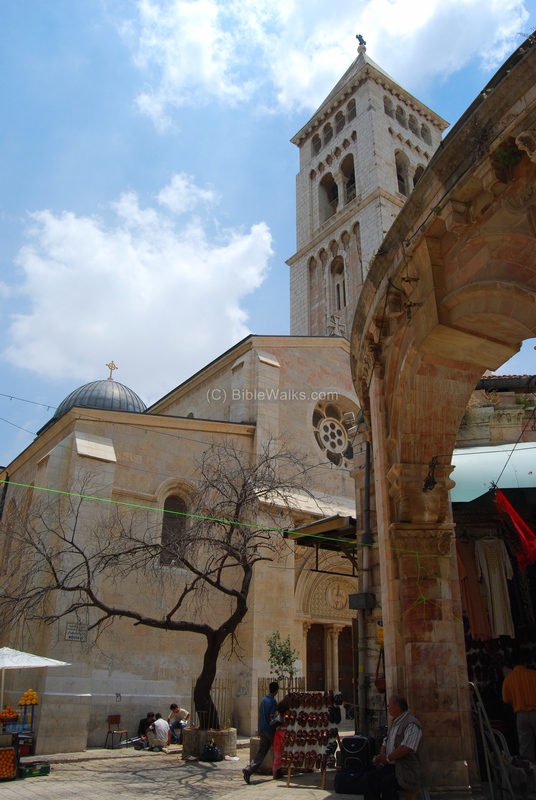 The church of the Redeemer is located in an area called "Muristan", near the Church of Holy Sepulchre (Sepulcher), and the Hospitallers' Church of St. John the Baptist. It is seen in the center of the Aerial view below. You can point on the purple points to navigate to the selected site. During the times of Jesus, the area where the Church of the Redeemer now stands was outside the city walls, in an area which is the traditional site of Golgotha, the crucifixion and burial site of Jesus. In the second C AD the Roman Forum was constructed in this area. This was the religious and political center of the Roman city of Aelia Capitolina (Jerusalem). 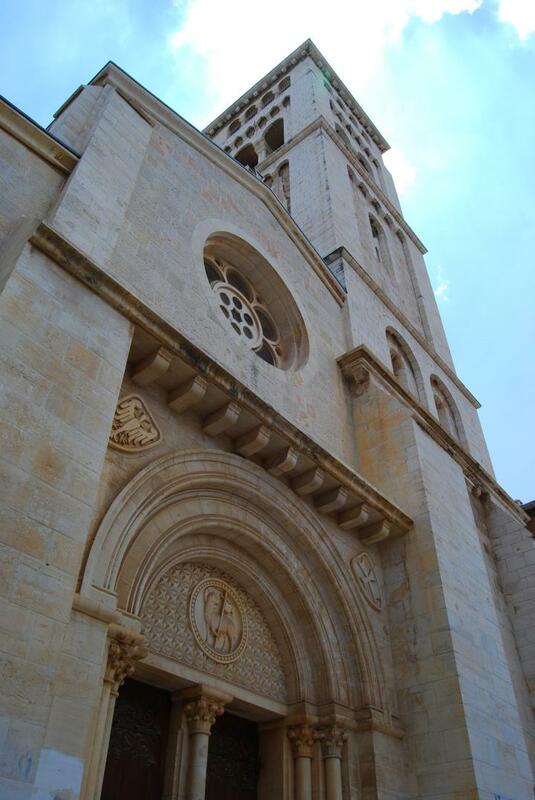 The ancient church of St. John the Baptist was built in the 5th C AD, and is one of the oldest in the Holy Land. It was dedicated to John the Baptist, and it is possible that the church presented some of St. John's relics, including fragments of his skull. According to Orthodox tradition, his head was buried in this church. The church, which is located nearby, was destroyed during the Persian or Arab conquest (7th C). The Italian merchants from Amalfi established in the first half of the 11th C, during the Arab conquest, a Hospital and Church ("Santa Maria Latina"). They added later another Church ("Santa Maria Maggiore" - Saint Mary Major - Mother of Jesus). 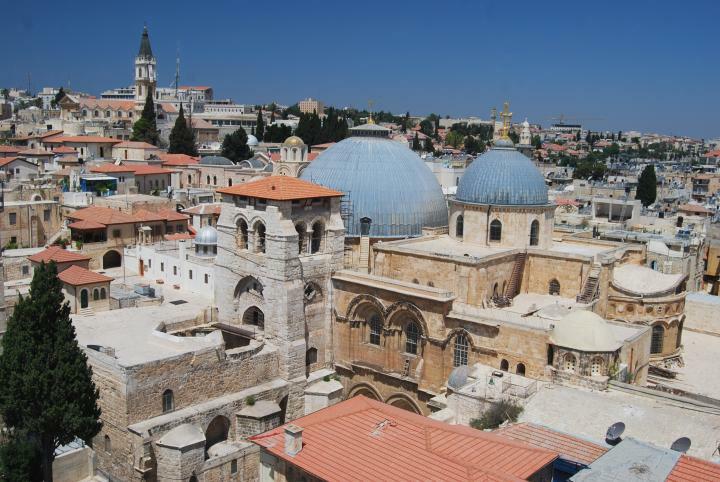 These structures were built near the southern entrance to the Holy Sepulcher, in the area of the Church of the Redeemer. 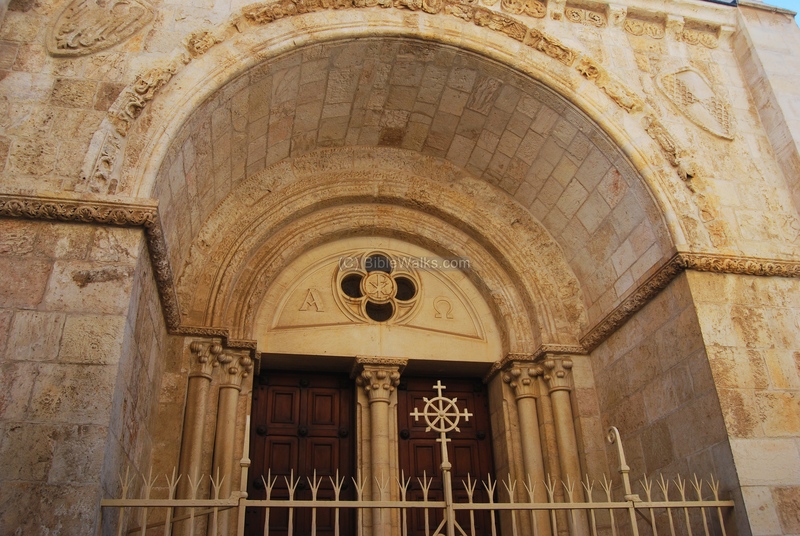 The arch of the Crusader gate is actually seen embedded on the north side of the Church of the Redeemer, which was built over its ruins. The Italian church and hospice functioned as a hostel and a hospital to the wounded Crusaders during the conquest of Jerusalem in 1099. Monks from the Benedictine order (Order of St Benedict) tended the sick and wounded warriors. This group evolved into a new local group that combined the religious zeal together with the Crusaders military life. 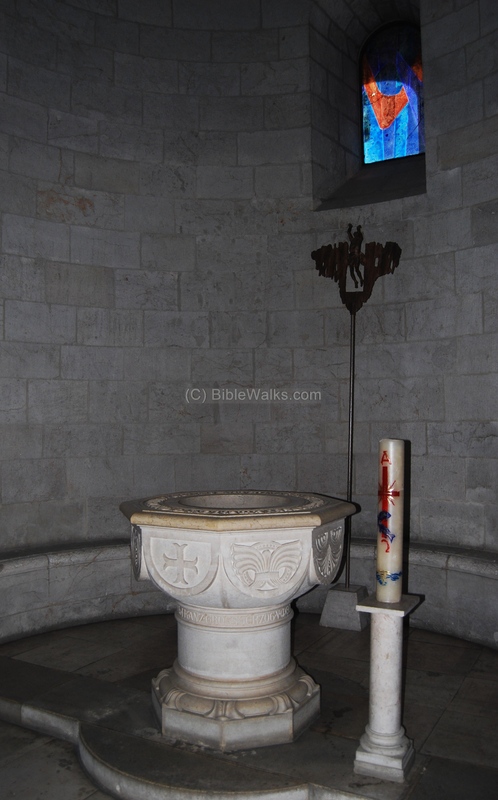 The order, officially established in 1113, named their order after John the Baptist, and were called the "Knights Hospitallers of St. John", or commonly known as the Hospitallers. At the 11th C they purchased and renovated the nearby church and monastery of St John the Baptist, and their living quarters and the hospital structures were located around the present site called "Muristan" which is based on the Persian name for "hospital". (You can see more about Muristan in another page). 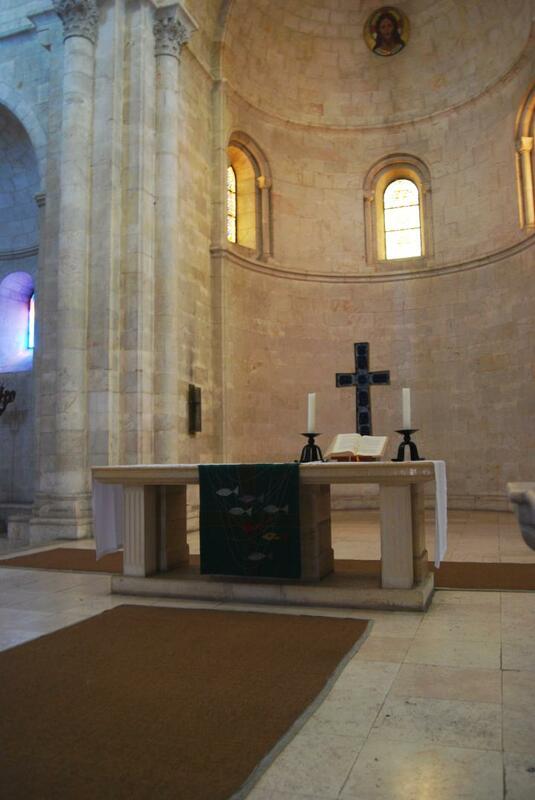 The Hospitallers became in the 12th C one of the important military orders defending the Holy Land. They established other structures and installations in the Holy Land, such as the knights halls in Acre. The "Hospitallers quarter" area was ruined after the Mamlukes conquest (1267), and remained at this stage until the late Ottoman period (19th C). Some of the monks continued to live in the ruins of the nearby monastery of St John. In 1839 the monastery of St. John the Baptist was renovated by the Greek Orthodox church. In the middle of the 19th C the Protestant movements, like other Christian orders, started a renewed interest in the Holy Land. In 1841 a Anglo-Prussian Bishopric of Jerusalem was established. The eastern area of the Muristan was given as a present to the Prussian Crown Prince Friedrich Wilhelm, honoring his visit to Jerusalem in 1869. Wilhelm later became Emperor for a short time (1888), but reigned only 99 days and died due to illness. His son, Kaiser Wilhelm II (1888-1918), succeeded him as the German emperor. In 1871 the first chapel (St. John) was erected at this place. A new church of the Redeemer was designed by Friedrich Adler, and its cornerstone was laid in 1893, and completed by 1898. In 1898 Kaiser Wilhelm II made an historic visit to the Holy Land with his his wife, Augusta Victoria. During this visit he dedicated the new church. The photo below shows the structure which was built on the eastern side of the Muristan market - the Church of the Redeemer. The entrance to the church, facing the west (Muristan street), is seen below. 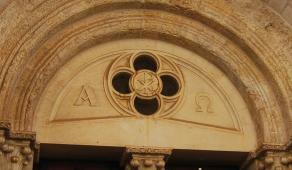 The Christian symbol of the lamb of God is seen above the door. It is a common Lutheran icon, which is based on the verse (John 1, 29): "The next day John seeth Jesus coming unto him, and saith, Behold the Lamb of God, which taketh away the sin of the world". Left side - an eagle with folded wings a German imperial sign, adapted in the 9th C AD by Charlemagne, the first Frankish king to gather the German Peoples into an empire, who placed a statue of an eagle on top of his palace. Since the 12th C the eagle represented power and unity and was incorporated on the German coat of arms. 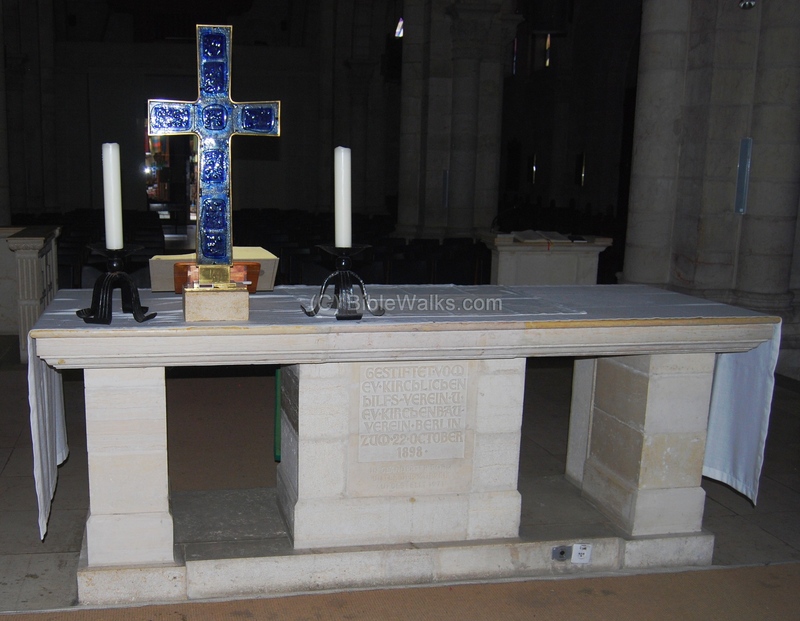 Right side - The Maltese cross, a type of cross which was the symbol of the Crusaders orders of St John. The architect of the 19th C church was the Berlin architect Friedrich Adler (1827-1908), who designed the church in a neo-Romanesque style. In the new church he incorporated ruins of a Crusaders period church - Santa Maria Latina - and other Crusaders elements that were collected among the ruins. The Crusaders-period original arch is embedded inside the north entrance of the church, as seen below. Alpha-Omega letters (the first and last letters of the Greek alphabet, representing that God is eternal - spanning the beginning and the end). 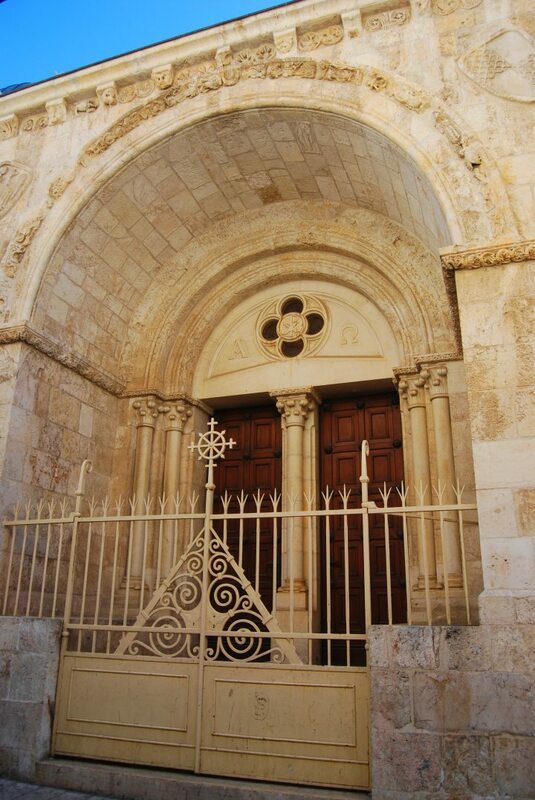 The Kaiser Wilhelm II (1888-1918) dedicated this church in 1898, when he and his wife, Augusta Victoria, became the first western rulers to visit Jerusalem. Kaiser Wilhelm II was the last German emperor, ruling in 1888-1918, and gave up the throne after the German defeat of WWI. The interior of the church is seen below, with a view of the main altar, which is facing east. 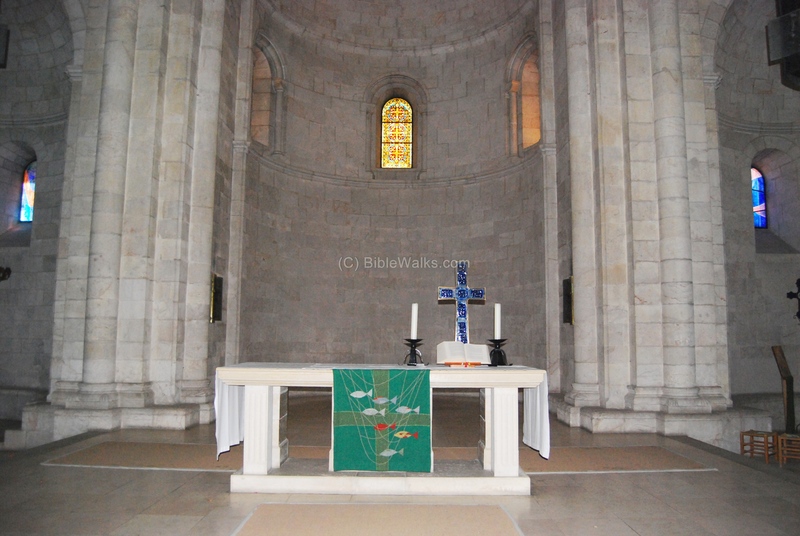 A closer detail of the main altar is seen below. The interior of the church's main sanctuary was renovated in 1970. The stained glass windows were created by the Jewish glass painter Anna Andersh-Marcus (born in 1914, moved to Israel in 1969). Her designs reflect the verse (Psalms 130:1): "Out of the depths have I cried unto thee, O Lord". The organ, located on a balcony above the main entrance, was installed in 1971. 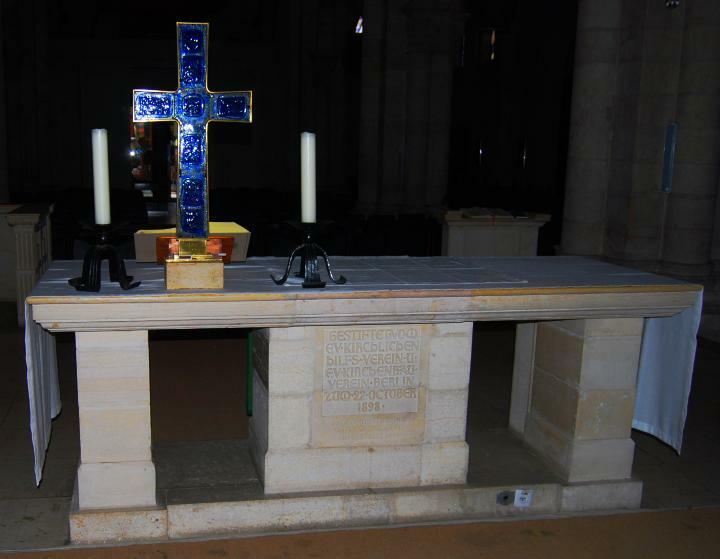 The photo below shows another view of the table in the main altar. Under another altar table, an inscription bears the the date "Oct 22, 1898", a week before it was dedicated by the Kaiser. A baptismal fountain is located underneath the northern nave. Behind it is a processional cross created (1998) by the German sculptor Hubertus von Pilgrim. A view of the church and its bell tower is seen below. This white square tower is the tallest bell tower inside the old city - 48M high, 7 floors above the ground. 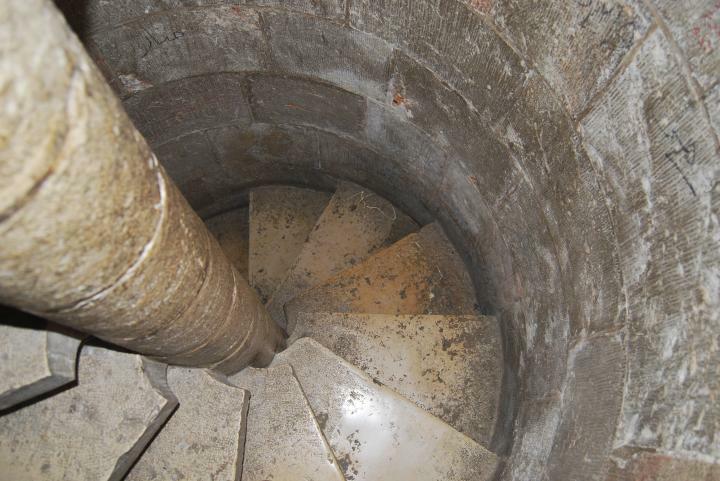 A narrow spiral staircase of 177 steps takes you up to the tower, with 2 breaks in the middle of the climb. Although you reach the top quite dizzy, you cannot be sure its from this spin or from the amazing scenes that appear to you from the balcony at the top of the tower. 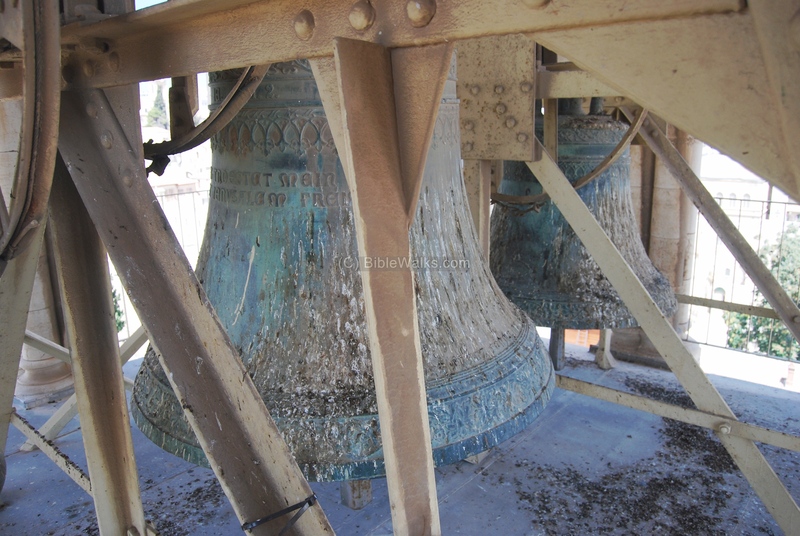 The top of the bell tower shows breathtaking views of the old city. 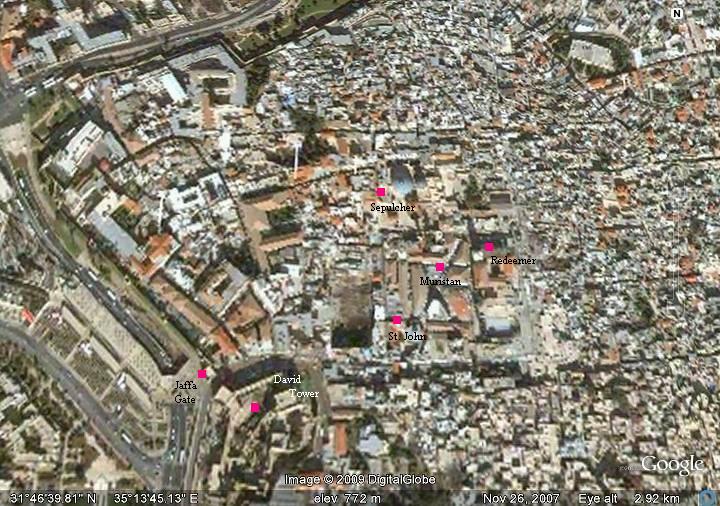 Don't miss this unique view of Jerusalem which can be seen in four directions. A sample of the four views is seen below. 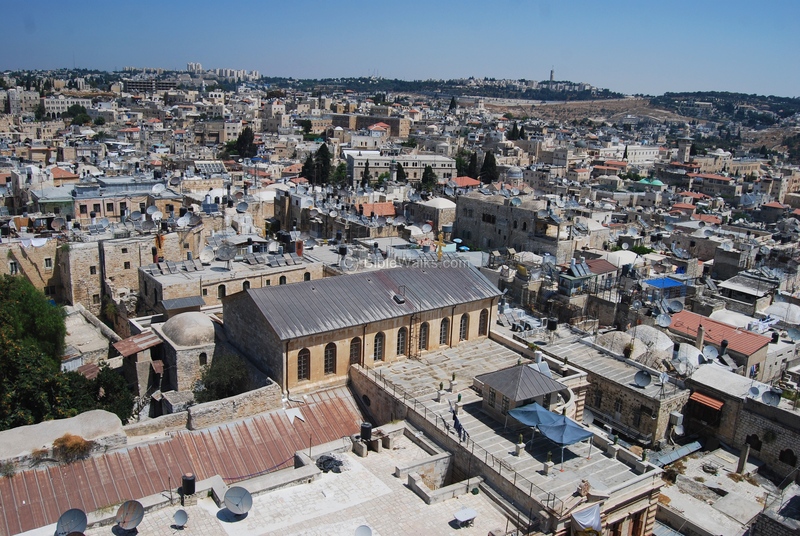 The photo below, towards the east, shows the grey dome of the Redeemer in the foreground, the Golden Dome of the rock in the far right, and the area of Mount Olives behind it. 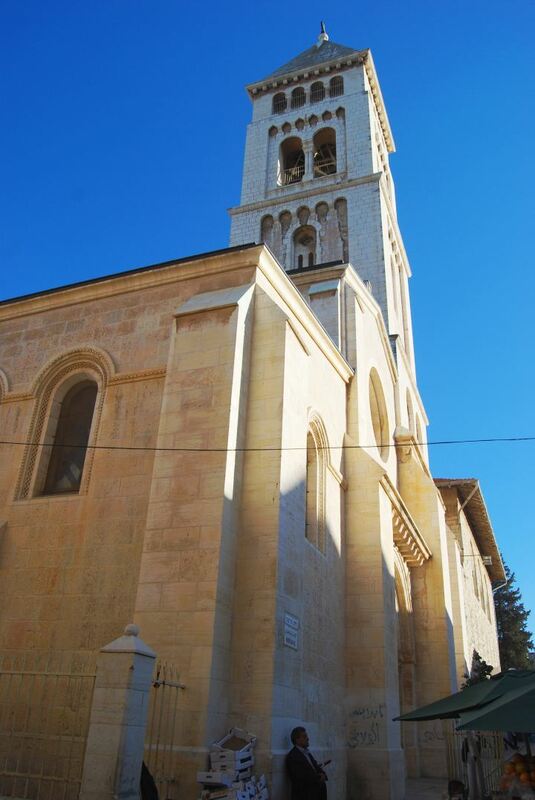 The square bell tower of Augusta Victoria - the other Lutheran church which is located on the northern side of Mt Olives - is seen on the far left background. The photo below shows a south view, with the silver dome of St. John the Baptist in the foreground and the Tower of David in the background. 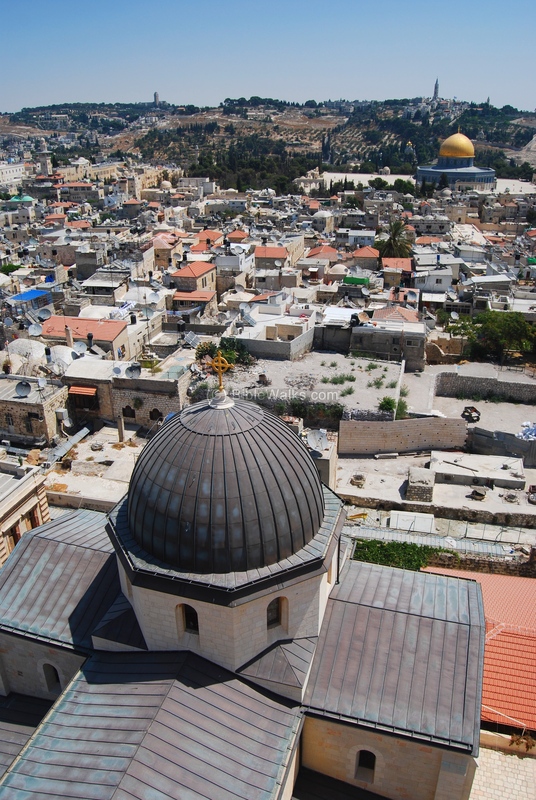 A view towards the west is seen below, with the double domes of the Holy Sepulcher in the center. A view of the North side is seen below, with Mt Scopus in the far right background, and the new high rises of the western city on the far left side. Muristan - The name of the area, based on the Persian word for hospital ("Bimarestan"), since the site is located over the ruins of the Crusaders-period hospital. The Redeemer - A person who redeems or pays back; also a name of Jesus (Galatians 3 13: "Christ hath redeemed us").